All meetings and events at St Mark’s, unless stated otherwise. Click here for our address and interactive map. Life groups are gatherings of 6 to 14 people who meet in homes across the city. Their purpose is to help us (i) share our lives together, (ii) encounter the life of God and (iii) affect the lives of those around us. (i) Sharing our lives: we come just as we are, giving and receiving the loving support we need for everyday life. (ii) Encountering God: we pray together, search the Bible, worship and step out in spiritual gifts. (iii) Affect others: we pray for others to come to know the love of Jesus and look for opportunities to demonstrate this practically. Powerhouse is our monthly prayer meeting and is very much “the engine room of the church”. At Powerhouse we worship God, seek to hear His voice and pray for one another, our church, our city and the wider world. Click below to find out more about the various initiatives we’re involved in, as we seek to share God’s love with the people of Leeds. Alpha is for everyone; no question is out of bounds and you are free to discuss as much or as little as you wish. We don’t assume any background knowledge of or belief in Christianity and everyone is welcome, no need to book in advance. Alpha is an opportunity to explore the meaning of life in an informal, fun and friendly environment. The Alpha course consists of a series of talks, looking at topics including ‘Who is Jesus?’ and ‘Why and how do I pray?’. We meet for lunch and each talk is followed by discussion in small groups. You don’t have to come to the whole course – just pop along for the first one and see what you think. No pressure. For more information, please email elizabeth.legendre@gatewayleeds.net. To find the dates of our latest Alpha, see the calendar. Volunteers from Gateway run a CAP Life Skills course, in partnership with Christians Against Poverty. Our volunteers are trained by CAP to provide a friendly and informal course that helps people develop the confidence and skills they need to survive on a low income. People will learn practical money saving techniques such as cooking on a budget, living healthily and making your money go further. For the latest course dates and information on how to sign up, see the calendar. Chillzone is our Friday night youth club held at St Mark’s and Little London Primary school. From 5:30pm – 7:30pm each week we welcome young people from school years 6 to 11. Our heart for Chillzone is to engage with young people from Woodhouse and Little London and to help each young person realise their importance and value. Each week we share how our weeks have been, followed by lots of sport and games, quiz and tuck. Chillzone is a great way to finish off the week! If you or someone you know is interested in coming along email joey.williams@gatewayleeds.net. Our community choir is open to anyone – regardless of prior musical training or experience. You just need a desire to get involved and give it a go! Choir director Lesley has a lot of experience teaching singing and encouraging everyone to enjoy music together. If you’re interested, whether you’re part of Gateway or not, please email her at lesley.davy@gatewayleeds.net. For upcoming practice dates, please see the calendar. The Marriage Course is for couples who are seeking to strengthen their relationship. Some couples do the course to intentionally invest in their relationship; others are looking to address more specific challenges. Either way, the course offers essential tools and practical ideas to help you build a relationship that lasts a lifetime. To find out when our next course is scheduled, please visit the calendar. Gateway Tots is a friendly stay and play toddler group where anyone with preschool aged children – babies to four years old – is invited to come and join us! There are loads of toys to play with, a craft table with something different to create each week, a time for stories and songs, as well as snacks! The group meets Wednesdays during term time from 9:30am-11:30am. Part of the Yorkshire Christian Football League (YCFL), FC Gateway has been running for over ten years and is a great way for Christians and non-Christians to come together to enjoy football. Games are played on Saturday mornings and the team is always looking for more players. Gateway runs a Trussell Trust Food Bank outlet from St Mark’s, as part of the Leeds North and West Foodbank network. It has been fantastic to be able to use our building to serve our community, as volunteers from Gateway and elsewhere work together on Mondays between 12.30pm and 2.30pm to provide emergency food parcels for local people in need. We also sign-post people to other agencies to help them address longer-term needs. Clients are referred to the food bank via charities, Citizens Advice, Social Services, the local authority, housing providers and various other organisations. Visit the Leeds North and West Food Bank website for more info, or email us if you’re interested in getting involved as a volunteer. Since acquiring St Mark’s, Gateway Music has hosted music events to showcasing local talent in our newly renovated, beautiful building. The acoustics of the church make it a fantastic place to perform live music. If you come along you’ll find a great crowd, good food and drink and a friendly atmosphere. You can find up-to-date information about upcoming gigs by liking the Live at St Marks Facebook page. Jesus includes baptism as a fundamental part of The Great Commission and discipleship. See Acts 2:37-41, 8:12 and 26-39, 10:44-46, 16:4 and 15, 16:31-33. Baptism became a fundamental part of the response of a believer to the gospel. Hence, it became known as ‘believers baptism’. Jesus was the only person who ever lived who didn’t need to be baptised (see v14), and yet He still chose to be. His reason: “to fulfi all righteousness” (see v15), meaning to fulfil what was right before God the Father and model an act of obedience and worship to all who would follow. From the above it is clear that baptism is a wonderful step of faith in Jesus, repentance, obedience and a declaration of discipleship. Romans 6:3-5: We are baptised ‘into’ Christ. Therefore, we share in His death, burial, resurrection, new life and glory! Thus baptism is a declaration – a seal, of our ‘union’ with Christ. The death of our old life (the baptismal water symbolising a grave) and our resulting new life ‘in Christ’. See Galations3:27 and Colossians 2:12. Baptism was designed to be an initiation into this new life in Christ. An initiation into discipleship and the body of Christ, His Church. Baptism is an act of spiritual worship; laying your life down before God as a living sacrifice. see Romans 12:1. Therefore, baptism is so much more than simply ‘symbolism’. There is spiritual significance to it. Hence why the early church practice was to baptise people as soon after genuine conversion as possible. Often in the same day (or even hour) as someone declared their faith in Jesus. And also why it was seen as a ‘sacrament’ or vehicle / channel of grace to the believer. The Greek word ‘baptizo’ means “to plunge, dip or immerse” something in water (or liquid, eg: dye). Jesus, was baptised by full immersion, see Matthew 3:16: “he went up out of the water”. The practise of the NT church was baptism by full immersion, eg: Acts 8:38 and 39 – they went “down into the water” and “they came up out of the water”. No example or teaching of ‘sprinkling’ with water is found in the NT. As Evangelical Christians wanting to be true to Biblical Christianity, believer’s baptism by full immersion is an essential part of our discipleship, membership and practice as a church. Here at Gateway, we believe the Bible clearly speaks of a body of believers in the New Testament who were committed to worshipping God together and serving one another. 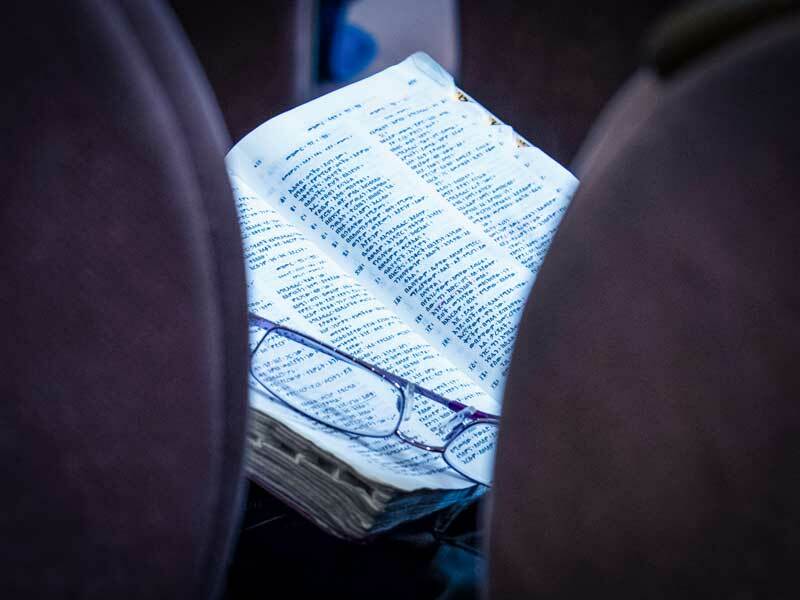 We see that God “added” to their number daily (Acts 2:47) and we recognise a consistent biblical metaphor for the church is that of a body – an intimate functioning body that is really connected and interacts. We believe that by committing to the local church, we truly get to build our lives together, reaching out to friends and to the wider world together. Gateway’s membership course, which is called our Vision and Values Course, is split into two sessions that last about two hours each. It is an informal and interactive meeting where there will be teaching from one of the church leaders about Gateway – what we believe and why – along with the opportunity to ask any questions that you may have. To find out when the next course is and to sign up, please see the calendar. Rooted is the men’s ministry here at Gateway. We aim to meet together regularly for prayer, worship, eating together, building friendships and hearing God’s word. Rooted is designed to address very relevant issues that men face in today’s culture, giving us an opportunity to share openly and honestly in a safe environment. The Rooted team’s heart is that God would build up a generation of men who have strong vibrant relationships with God and with each other. We know exactly how it feels to turn up in a new city and how finding a great church to get stuck into can be crucial to feeling settled. This is why we are passionate about welcoming you into the Gateway family! Students from many academic institutions in Leeds attend Gateway. We have Life Groups for students and host socials throughout the year! The easiest way to get involved and stay up to date with what the Gateways students are up to is to request to join our Facebook group. Vivid is the women’s ministry at Gateway. They aim to see all women to build authentic relationships and be strengthened in God! They do this through various meetings and fun events designed specifically for the women of the church. Keep an eye out on the calendar for these events!